With the first warm day of the year, ( 60 degrees ) Station 52 was dispatched for the vehicle accident involving a motorcycle. 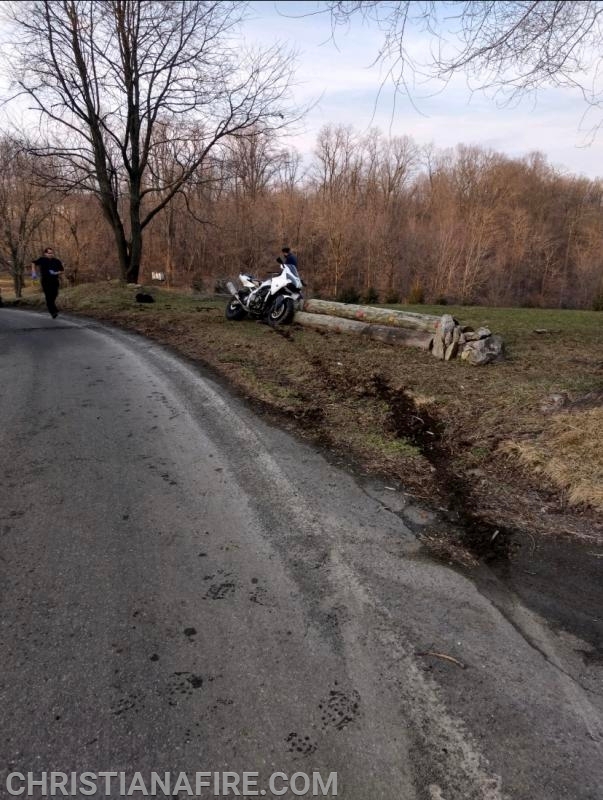 The accident occurred in the area of the very sharp curve at 1109 Simmontown Road in Sadsbury Township. Engine 521 ( Capt. Stoltzfus ) responded quickly with crew of 5, followed by Squad 52 ( FF Miller ). Duty 52 ( AC Reimold ) arrived on location with a motorcycle off the roadway into a tree, with one patient complaining of shoulder pain. Patient was transferred to the hospital by Ambulance 49-1 ( White Horse ). Christiana Fire Police handled traffic control. Company cleared the incident at 16:39 14 members assisted.